Properties in Robiei Lake average 4.6 out of 5 stars. Property 57: Dreaming under Ticino heaven! Perfect apartment in perfect location! 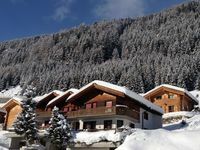 Absolutely gorgeous and super kozy apartment within a 3 minute drive from the main ski lift in Dieni. Everything was simply perfect! Thank you so much! Lovely spot, clean and well equipped with everything you could need. Just two of us, but a great spot for families as well, with kitchen. Host speaks English well and was there to greet us and help with anything we need. I would go there again.